With the current potential nuclear crisis in Japan, I have been inundated with questions about Fallout Survival, Nuclear Preparedness, General Preparedness and Potassium Iodide among many other things. I realized that while a lot of these things are covered on Utah Preppers, Potassium Iodide is kind of glossed over. This post is my answer to all those questions and should be a definitive post on KI or Potassium Iodide. Please note: at this time, due to the crisis in Japan, KI is Sold Out pretty much everywhere. Potassium Iodide or KI is a salt of iodine and is what the body uses to make thyroid hormones. If you are exposed to radioactive iodine through fallout , your thyroid will quickly absorb it into your thyroid and cause serious problems. By super loading your thyroid with safe iodine via Potassium Iodide you can minimize your bodies absorption of radioactive iodine. It should be noted that Potassium Iodide is NOT a cure for radiation sickness nor will it prevent other problems that will occur from fallout or radioactive exposure. Potassium Iodide should be taken when exposure to radioactive iodine is imminent. Local Government and Health Officials will notify the public if this precaution becomes necessary. Taking Potassium Iodide does not provide 100% protection against radioactive iodine. Factors include how soon prior to being exposed that Potassium Iodide was ingested, how fast it can absorb into your blood and the total amount of radioactive iodine the person is exposed to. In other words, it’s critical to take as soon as notification is issued, that you take it in a liquid form and that you take the proper dose. And, of course, that you limit your exposure to any kind of fallout as much as possible. Taking a higher dose of Potassium Iodide or taking more than is recommended does not offer more protection and may cause severe illness or death! These doses of Potassium Iodide are sufficient for 24 hours. Typical expectations of exposure risks are that if dosing is needed it will likely only be needed for 24 hours. However, it is possible that exposure risks will continue for several days. Local Government, Health Officials and Emergency Managers will notify you as to how long you should be taking it. Potassium Iodide may be harmful to you if you are allergic to iodine or with certain skin disorders. There is minimal risk to taking Potassium Iodide unless it is taken for several days, you take more than the recommended dosage or you have a pre-existing thyroid disease. In my opinion, the easiest way to figure out how much Potassium Iodide to store is to calculate the maximum adult dosage (not the lower children’s dosage) for each member of your family and multiply it by 7 (1 week). This is designed to give you an excess to allow for spillage, etc. So, for my family of 10, I calculate 130 mg X 7 X 10 = 9100 mg or 9.1 grams. I purchase Potassium Iodide in 40 gram bottles (typically for $10 – $15) and have enough for pretty much my whole neighborhood. Sunday morning. The sun came up in the East, as it has done for the last year or two. Something comforting about that. No matter what the people of the world are doing to each other, the sun comes up in the East. Chris's battery powered alarm clock went off at 7 AM. He rolled over, and shut off the alarm signal. Put his glasses on, and looked around the room. On the other side of Sam's living room, Gomer was also trying o tun off the alarm clock. However, there was no alarm clock near his bed roll. It was just force of old habit, he was responding to the noise of Chris's alarm clock. Farther East, Heather was waking naturally, as the sun came streaming in the bedroom window. She gracefully slid her feet into her pink fuzzy slippers, and put on her bath robe. Walking down the hall, she knocked on the door of each of the kids bedrooms, to help get them started. Sunday was too important a day to miss by sleeping in. Heather walked into the living room, and found Faith sitting up on the couch. Big surprise, she'd been laying down unconscious for the last day or two. "How you feeling?" Heather asked. Faith was barely able to focus her eyes on Heather, and then mumbled "What the heck happened". Faith's two daughters came down the hall about that moment, and were excited to see their Mom sitting up. They started to talk at the same time, and tell Mom all that had happened. The deer, the night in the mini van, the camp fire, Heather coming to get them. The phone call with Gomer, on her cell phone. Faith didn't say much, just listened. Heather came over with the BP cuff, and stethoscope. Checked Faith's blood pressure and pulse. Both were much better than before. Heather told her that the family was going to church. She'd best to stay home, and get her strength back. They would be back shortly after noon. An then they would have lunch, after they got home. Are you hungry? Faith shook her head, no. Heather went to the kitchen, where Melissa had already started mixing the pancake batter. Not much milk left, have to stop by the local dairy farm. Plenty of water, the drilled well never ran out. And there was plenty of fuel for the generator to run the well pump. There was a dug well and a pitcher pump for when that did happen. After breakfast, Heather sent all five kids back to their bedrooms, to get dressed for church. Shawn looked disappointed. "You mean, clean clothes and shoes and all?" Heather nodded. Shawn burped, and tried to lick the pancake syrup off his nose. He twisted his eyes, cross eyed, so he could see what he was doing. Heather had to laugh, even though that wasn't Sunday behavior. Seconds later, Melissa returned to the kitchen. She was wearing a bright yellow print dress, with pictures of flowers. And a correctly sized handbag, white gloves, and red high heels. For eight years old, she really knew how to dress for church. Faith's girls only had play clothes. But, that's ok, they were away from home. Zach and Shawn were much slower to return to the living room, they didn't enjoy church. Heather said "Well, I guess Faith's girls can sit in the front seat with me. They have been through a lot." The other three kids were disappointed. Can't hardly see much from the back seat. But, they knew not to argue. Heather left a cold Pepsi on the end table for Faith, in case her appetite returned. And then locked the door as they left. At Sam's place, much the same scene there. Sammy came out to breakfast in work clothes. Jeans, and T-shirt. Sam's daughter looked like she was going to a very expensive date. Gomer was wearing the same old BDU he'd worn the last couple days. The desert cammo pattern looked a bit out of place, rumpled and plenty of grease stains from working on the Model A. Chris hadn't brought a change of clothes. So, he looked like an appliance repairman, just like always. Brenda had a dress she hadn't worn in years. And sensible shoes, she'd be driving a stick shift car to church, after all. Sam looked a bit strange, wearing suit, tie, and crutches. "Saddle up! We're riding out!" Sam hollered to no one in particular. said the same thing every Sunday. Five people would be a tight squeeze in a Model A. Gomer mumbled something, and Sam asked him to speak up. "Not going!" Gomer replied. He wasn't much interested in church. Sam told him in no uncertain terms that his soul needed saving like everyone else in the world. And to come along. God would watch the house. Gomer just wasn't much interested in church, and finally Sam looked at his watch. Rolled his eyes, and turned away. With four people int he Model A, there was plenty of room for Bible cases, and Brenda's parasol, and all the other goods. Sam wore his pistol under his suit jacket. Bulged a bt, but he figured people would understand. Chris asked for directions to the LDS meeting house, and headed off in the other direction in his Blazer. Left Sam sputtering. "Nice kid, we've got to do something for him. Poor lost soul." Brenda suggested to invite the pastor over to lunch, and let him do the job the church had been paying him to do. Gomer could use some preaching, too. Sam leaned over and kissed her. Such a smart wife, she was. And truly a gift from God. In Tennessee, Martha was trying to convince the kids that they also needed to go to church. She didn't know what kind of religious education they had with Connie, but figured it wasn't much. A couple minutes later, Chris pulled into the parking lot of the LDS church. About 100 people had arrived for services. The chapel was rather dark with no electricity. But there were windows, and plenty enough light for services. The microphone wasn't working, so the Bishop had to holler a bit to be heard in the back row. Greeted everyone at the services, and invited one of the High Priests to open with a word of prayer. They then sang an opening song, and the sermon began. The LDs had a very brief sermon, and they passed the sacrament. Bread was getting hard to find, and they were near to out of cups for the sacrament water. But, there was enough to make do. The familiar pattern was reassuring to Chris. He recognized the familiar pattern of the church services, and that was comforting. After church, no one wanted to leave. The water was on, and someone had set up a couple flash lights in the bathrooms. The women went to freshen up, and the guys went to take care of business. The folks stood around in the parking lot, and chatted. Chris got to meet many of the other people. Find out that typical of LDS / Mormon folks, many had some food and fuel stored at home. No one was in really hard times. And the folks who were having trouble were getting assistance from their home teachers, and visiting teachers. Chris chatted with the other folks, for about half an hour. And then got in he Blazer, for the very short drive back to Sam's house. He met the two missionaries. Kids, 19 and 20 years old, who were serving from Salt Lake City, and from Idaho. He gave them Sam's address, and suggested they stop in for lunch. The kid missionaries had their bicycles, and five miles was possible. They said they would stop in today, as soon as they could get there. "How about strap your bicycles to my luggage rack, I'll give you a ride there, you can bicycle back?" They accepted, and glad for the ride. They hadn't ridden in a car, in several days. At least since things got worse. On the way back to Sam's house, Chris learned a bit about their missions. One of the Elders asked if Sam had a blessing for his broken leg? No, there wasn't a second Elder to help. Well, now there are three. Chris liked that idea. Maybe one for Gomer, also, as he was depressed. Fortunately, it was a fairly short Sunday. Because the usual three hour church service, and they would have missed lunch at Sam's. The church Sam attended, did one hour service. Sam and Brenda arrived home. The two kids had chosen to stay in town. There were other teenagers at service. Sammy saw his girl frend, the gal he'd gone to high school with. So, Sammy decided to stay in town. Pastor Peter was kind enough to ride in the back seat. Give Sam more room to stretch out his broken leg. Pastor Peter did have several invitations for lunch. But figured that saving a Mormon's soul was the most important thing he could do with his day. They got back to the house, and Pastor Peter opened his Bible on the dining room table, and began to read from it. Brenda excused herself to go to the kitchen and start lunch. Gomer turned up the volume on the video game he was playing, and tried to drown out the sound of the Bible teaching. Wrong thing to do, pastor Peter came from a long line of hollering fire and brimstone preachers. He just turned up his own volume a bit. After a while, the Bible teaching was echoing from the trees along side the house. And, this was about the moment. Chris arrived, with the two Mormon elders. Really knows how to make an entrance, Chris does. Pastor Peter looked simply astounded. Well, now, he'd have three souls to save. Praise God! And, praise, he did. Even louder. Finally, Brenda thought she could keep the lunch in the oven no longer. She quietly, without a word, brought out lunch from the kitchen, and sat it on the table in the dining room. Pastor Peter realized that everyone was hungry, and so he closed his sermon with a grand and quivering Amen. There’s usually only one way to dig yourself out of a mess in a survival situation and that’s by having a good shovel handy. The main problem is that it’s pretty hard to carry a full size shovel with you all the time. While a full size shovel can be easily carried in a pick-up or a trailer, they don’t fit very easily into the trunk of your car or on a backpack. Whether you find yourself stuck in the snow, the mud or a bunch of loose sand, a compact shovel may be just thing to dig yourself out of a bad situation. Having a military-style folding shovel and a folding pick version is great but carrying both can be a little awkward and a little heavy when added to the rest of the gear that you may be carrying in your pack. Been there and done that! This is where the real versatility in a lightweight and compact shovel comes in handy. You get the versatility of both a shovel and a pick with this survival tool and don’t have to carry the added weight. At slightly less than 2 pounds, this compact survival shovel folds up easily into a 6” pouch that can fit easily under your car seat, in your trunk or your bug-out bag. You could also carry it on your belt but even at less than 2 pounds that’s a lot of weight to added to your belt. This particular compact shovel assembles easily with only two main components and has a very sturdy steel handle with oversize rubber grips which allow you to easily get a good grip on the handle. It also allows several different configurations for use as a shovel only, pic only or a combination of both by merely loosening and tightening the adjustment knob on the handle. At a mere 16 inches in length it will also allow you to get into some pretty hard to reach places. Although a longer handle will give you more leverage, sometimes they can also get in your way if it’s needed in a tight space. Saving weight and space with your survival gear will lighten your load and give you additional room for others items you may need as well. With a relatively low cost, it won’t dig a big hole in your pocket either! Got digging tool for survival? Cry "Caesar!" Speak, Caesar is turn'd to hear. - Shakespeare's Julius Caesar Act 1, scene 2. 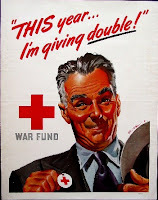 The month of March may be halfway over at the Ides but it's not too late to mention that March is Red Cross Month. The American Red Cross (ARC) responds to disasters, helps members of the military, provides blood for those in need and teaches lifesaving skills. Every year the Red Cross responds to more than 70,000 disasters—including approximately 150 home fires every day. About 11 million Americans turn to the ARC to learn first aid, CPR, swimming, and other health and safety skills. Last year, more than 158,000 people volunteered to teach those courses. Half the nation's blood supply— six million pints annually—is collected by more than 155,000 Red Cross volunteers . Among the emergency services for the men and women of the armed forces is the delivery of urgent family messages—around the clock and around the globe. More than 30,900 volunteers serve as chairs, members of boards of directors, or on advisory boards for local Red Cross units - chapters, Blood Services regions, and military stations. A hot meal delivered to victims after a disaster, blood when it is needed most, shelter when there is nowhere else to turn, an emergency message delivered to a member of the Armed Forces from their family -- these are just some of the ways that gifts are put to work through the American Red Cross. Thanks to the generosity of donors, the American Red Cross is empowering people to perform extraordinary acts in the face of emergencies. Find out how to donate online or by mail. See http://www.redcrossblood.org/make-donation to find a blood drive near you. See http://www.redcrossblood.org/donating-blood/eligibility-requirements to see if your are eligible to donate blood. During Red Cross Month, the ARC asks that you support your community by making a donation, volunteering, taking a class, or giving blood. Natural Disasters are horrible. They have the tendency to tug at our collective heartstrings and most Americans feeling that tug, immediately look for ways to help. There's no doubt about it, America is filled with generous people. We, thankfully, live in the land of plenty and don't mind sharing it with those, truly in need. Unfortunately, the online predators are banking on it. Often they are able to spring into action by posting their counterfeit websites faster than the legitimate charities are able to respond. During these times of great need, the last thing anybody wants is for their donation to wind up helping some dirt bag with a drug addiction. Personally, I feel that anyone who willingly prospers from a tragedy like the Japanese tsunami or the earthquake in Christchurch, New Zealand doesn't deserve to breathe the same air as the rest of us. What they need is to take a fast trip down a long flight of stairs but that's for another blog post on a different day. Today, I'll leave the justice part with the capable hands of the Almighty and focus, instead, on ways to help you avoid getting fleeced. Never respond to an email that is directed to you requesting assistance. If you want to help, research charities and contact them directly. Never click on a link sent to you in an email. Research the charity you wish to support, find out what their official website address is and type it in the web browser yourself. Avoid newly formed charities-Most charities have to jump through a ton of hoops in order to be considered a legitimate charity. Organizations formed in response of an event should be highly suspect. Do not send supplies. Charities are quickly overwhelmed with supplies that they don't need. It is far more efficient for a charity to purchase in bulk than it is to handle and sort millions of individual care packages. Giving by text is extremely easy. Make sure you know, for sure, who your texting to, before sending that text. Realize it may take up to 90 days before the designated charity to ever sees a dime from your text donation. Let Twitter, Facebook, and other social media outlets inspire you... to research. Do not become overwhelmed by the images you see and give blindly. Know who your giving to and where the money is going to. Consult sites such as Charity Navigator or the Better Business Bureau's Wise Giving Alliance to thoroughly research the organization before you send that check, credit card number, or text. Bottom line, think before you give. Your intentions, more than likely, are noble but your good-will will do nothing for those suffering, if your money goes to a con-man. Hope this helps. The survivalists’ old standby for hunting small game has always been a small .22 rifle or pistol. While definitely no replacement for a good rifle, the pellet gun offers several advantages in a survival situation, here are a few to think about. Why a Pellet Gun ? 1. Open Carry. Open carrying or storing of firearms in a vehicle or in public is prohibited in most areas, but there is no such restriction regarding pellet guns in most areas (Check with your local law enforcement agency). 2. Noise. Pellet guns are much quieter than a traditional rifle. With almost no report outside the immediate firing area, with a pellet gun you are able to hunt small game without giving away your location or your activity. Some new pellet guns come with a legal suppressor (No stamp required). 3. Economics. The pellet gun is more friendly to your wallet to purchase and maintain than a rifle. The ammo is also much cheaper and lighter to carry around. A pellet gun can easily take down small game from the size of a turkey on down to a squirrel. Is a Pellet Gun a Deterrent? A. It is very hard to tell a pellet gun from a regular rifle, especially looking down the barrel. Note: This applies to Law Enforcement Officers as well so take care not to appear threatening – getting hit with a 9mm round because you had an air rifle could ruin your day. B. Getting shot with a pellet gun hurts like hell and no one wants to get shot with one. Pellet guns come in two different styles, those that are powered by bottled Co2, and those that are powered by the air around us that is compressed by pumping a lever on the gun. The single pump air rifles actually compress a spring that drives a piston to compress the air for firing. Still an air rifle but as the gun is used, the spring may weaken so check the history of the gun before buying. The type that is powered by muscle power is the more viable option in a survival situation because it does not rely on a non renewable fuel to make it shoot. They are also available in pistol and rifle configurations. Some pellet guns can fire in excess of 1200 fps. Be sure to get a gun with a minimum velocity of 550 fps, to be most effective against small game. Pellet guns come in two different sizes of ammunition, the more popular being .177 cal. A box of 550 rounds of .22 Lr. ammo is about 20 dollars, which works out to around 4 cents a round, not much but lets consider the cost of pellets. A tin of 300 .177 pellets is about 2 dollars, which works out to about $.6 cents a round (less than a penny a shot). Also in some pellet guns 4.5 mm BBs can be fired for target shooting, the price for 2400 4.5 mm BBs is about 4 dollars, which works out to about $.4 cents. The difference in ammunition prices is obvious, even if you just use a pellet gun for cheap practice, you will save a bundle on ammunition prices. The fundamentals of shooting are the same with a pellet gun as they are with a real rifle. Historically, air rifles date back to the late 1700s. In fact, at the time they were at least as capable as the gun powder fire arms of the time. The Girandoni Air Rifle air rifle carried by Lewis and Clark could fire up to 40 balls of around .40 caliber at velocities similar to black powder guns of the day. A replica put a steel ball through pine boards at 100 yards – definitely a lethal weapon. Its drawback was that it took 1500 pumps to have that ability. That plus the expense to build made them a rare weapon. Still with a 22 round magazine, it was impressive to the Native Americans they met on their travels. Since the explorers were very careful not to let the Native Americans know how many guns they possessed, the supposition was that EVERY member of the expedition had one of these fine, multi-shot weapons. No one wanted to start a fight with these super weapons in the hands of their enemies. Even the big bore air rifles would not be my first choice for a survival weapon, they definitely have a place in a survival battery or a possible hunting tool stored in a below ground Survival Cache. When you need a cheap means for taking down small game, or perhaps a gun that you are going to need to stash some where for long periods of time without worrying about it affecting its reliability or your ammo going bad, consider the pellet gun. The pellet gun is also the perfect way to introduce young shooters to the concepts of gun safety. While the pellet gun may not be the ultimate tool for survival hunting, it has its advantages for sure. Please tell us about your experiences with pellet guns in the comments below. One of my less tasteful friends made the comment that Japan had to wait sixty years to return the favor of Hiroshima and Nagasaki. I suppose, in a sense, he was correct. There's been much in the news about having to deal with potential radioactive fallout from the Fukushima powerplant's possible meltdown. Unit One and Unit Three have already been rocked by explosions and the threat to the remaining reactors is growing. Some news articles contend that a meltdown is in progress, or a partial meltdown has already occurred. If a meltdown does, or has, happened fallout in the form of heavy and light particles will rise into the atmosphere and travel across the Pacific Ocean on air currents. Maps tracking fallout patterns to the west coast of North America as well as an excellent article can be found here at Modern Survival Blog. It has updates on the developing situation and pertinent information regarding personal preparation. The good news is many of the heavier particles will drop out of the airstream over the Pacific and probably not make landfall in North America. The bad news is the more fine, lighter particles, will travel farther before dropping out of the airstream. These will make landfall, possibly as far as Colorado, before dropping out. The good news is that if the quantity of fallout is small, it will be so widely scattered as to essentially disappear into normally present background radiation sources. And there's where the hitch is. How much fallout North America will have to deal with is also a question that is, pardon the pun, up in the air. If we use Chernobyl as a representation of a possible scenario, an estimated 50 TONS (100,000 pounds) of nuclear fuel "evaporated" in the explosion and fire. Much of it landed in the area immediately surrounding the plant, and even more in the areas downwind in the Ukraine. But significant materials remained in the air so that it traveled and triggered radiation detectors in Western Europe, and even the Eastern US. Remember, Chernobyl was a single reactor. Japan is dealing with the potential for multiple reactor failures. What most people should be concerned with are Cesium 137, Strontium 90, and Iodine 131. Cesium 137 is released by reactor accidents and presents a significant health risk in that it distributes itself through the soft tissues and is a strong source of ionizing radiation. Ionizing radiation can destroy your DNA and disrupt the body's cellular functions. Half life is 30 years, and the primary path into the body is ingestion and inhalation. Strontium 90 is not likely to be released by a reactor accident, BUT it can be. Strontium 90 mimics calcium and is readily taken up by the body. Half life is approximately 30 years and the primary path into the body is ingestion and inhalation. Iodine 131 is readily absorbed by the thyroid gland as it mimics the non-radioactive form of iodine which is needed for the production of certain hormones. Half life is 8 DAYS, not years, so that is a sort of a blessing. Primary path into the body is ingestion. Wash all produce thoroughly with clean running water. Avoid drinking from open water sources (streams, ponds, etc.). Much has been said about purchasing Potassium Iodine (Iodate) in order to flood your thyroid with the needed element to prevent the uptake of the radioactive form of Iodine. Apparently, there are rumors of panic buying. If you find yourself unable to locate iodine supplements , there are natural sources that are readily available. Another strategy is eating peanuts, soybeans (and related like Tofu), canola oil, cassava, strawberries, pine nuts, millet, pears, peaches, spinach, bamboo shoots, sweet potatoes, and anything in the Brassica family. These are known to inhibit the absorption of iodine by the thyroid. This last suggestion is a stop gap measure only to be considered if you do not have access to a source of iodine . Just over the past few years there has been a lot of disasters on this small planet. There have been tsunamis, earthquakes, tornado’s – and more. Nature is always threatening and if you are reading this then you are not unfamiliar to the man-made problems that can occur. The word seems – at least to me – to becoming more and more volatile and dangerous. I tend not to post much about specific “current event” disasters such as what is going on in Japan right now because so many do it better than I. However – the unfortunate events that are affecting tens of thousands of people should serve as a reminder that anything can happen at anytime. If you value the safety of yourself and your family – the time to prepare is NOW. Over the past few months I have been stepping up my prepping. Increase food stores has been and continues to be a priority. I have a plan made on what I will continue to do over the next few months and into the Fall – and it revolves around suring up my preps in several areas. I suggest you do the same. I have been planning on doing an “Introduction to Prepping” post for some time and this will NOT be it. No matter- I want to throw out a few ideas and suggestions especially if you are still in the beginning stages of prepping. Food & Water – Get it! Without it you are in bad shape. Stock up on what you currently have in your pantry by buying extras. Shop the sales and get foods that provide sustenance (calories). Fill your cabinets and then fill totes. Buy spring water by the gallons. Store water in containers such as rinsed soft drink containers. Buy a water filter such as a Berkey or at a minimum those you can find at Wal-Mart and Target. The bottom line is – and although food prices have increased recently – you can find good deals and with a little bit of money you can buy quite a bit if you shop sales. Firearms - Get something! If you already have a firearm – great. Do you have plenty of ammunition? Do you have magazines for it? When was the last time you shot it? You need to be able to use your firearm proficiently. Time for a reality check: There are a lot of bad people out there. If a significant disaster happens – and you have supplies – there will be those that do not have supplies and they WILL come to take yours. Don’t doubt that statement. What guns to have has been discussed many times – but if you could only have one – a shotgun is a pretty good choice. Methods for Light - Got flashlights? One of the first things to go in a disaster is power. Without power – once the sun goes down your ability to see will be gone as well. Flashlights are incredibly powerful nowadays and relatively inexpensive. Buy several and have plenty of extra batteries . I recommend getting ones with LED bulbs as they sip from the batteries and last a very long time. Battery operated lanterns as well as those run from oil or propane can be used to light up an entire room. Communication – Let’s talk! Sitting with your food, guns, and flashlights will be stressful enough without any method of contacting others and finding out what is going on with the situation. Have a battery or hand-crank powered radio available so you can listen for incoming news. If you have a battery powered radio- have plenty of extra batteries. If you are not alone and have family members- get a pair or two of FRS/GMRS radios so that should someone need to leave your position to patrol, check shelter conditions, or whatever – you will have some method of communication. Most likely in ny type of disaster cell phone service will be absent. Medical/First Aid – Get a good first aid kit! If you or a family member has a medical condition requiring medications -stock up on extras – as much as you can. Having a decent first aid kit is the first step in preparing for any kind of disaster when it comes to medical situations. Stock up on extra rubbing alcohol, hydrogen peroxide, antibacterial hand sanitizer , Clorox bleach, and Lysol will assist in keeping sanitation-related illnesses at bay. Call this a “Call to Action” to sure up your supplies or just a reminder. Either way – the time to prepare is NOW….while you still can. Brenda chattered on, and on. She and the other women had met in the town square, and along the roads, and in driveways. They had set up an informal network of information. Some folks were out of food, others were out of fuel, batteries, diapers, or other things. They set up an informal network and exchange, to help each other out. Of course, most of the women had known each other for years. Serving together on school boards, picking up each others kids at the bus stop, and so on. They already had the network, they just used it for survivalism, now. Sam was astounded, how much good intel she had had brought home. It was light years ahead of anything he'd gotten from the radio in the house. They had set up an informal barter meet, to be held in the town square, Sunday after church. Sam had been an active member of the local Methodist congregation. The pastor there had been preaching for many years. Pastor Peck had a gentle approach, and a bit of grey hair. He had never married, but had dedicated his life to the ministry. Pastor Peck also had a good sense of humor. When he had to rebuke the congregation for something, he would call it a Pastor Peck Pick. He would nit pick over something or other, usually casual clothes, or use of crude language. The teenagers were found of saying that if the apostles visited, that Peter Piper Picked a Peck of Pastor's Pick. But, secretly, they respected the man for his sincerity. Sam went into the house, to have Brenda tell the others about the trading square. They were doing fairly well with most things. But it would be a good chance to get out to the town, and set things right. Gomer was in the dumps, he might need some time with the Pastor. Maybe get Sammy in to talk to the pastor. See if they could figure out what's wrong. Fortunately, it was Saturday and the trading fair was the next day. That's what was on Sam's mind, the trading fair. Chris asked if there were any Mormon congregations around. That's Chris's brand of church. Sam didn't know. Chris suggested that he could find that information easy enough online. Just go to www.lds.org and look for meetinghouse locator. Sam had to remind him that the internet wasn't working. Oh, well, then, phone book. The phone book showed a LDS congregaton in the next town over, so Chris figured go to that. Take the Blazer, it's only about five miles. Sam decided not to tell Chris that he'd been sucked into a non-Christian cult. Figured he'd let Pastor Peck do that. Maybe even save Chris's soul. Out to the town, that's what Martha was thinking about that moment. With big news like that, she just had to tell the girls. Her normally timid husband had shot two house burners, and was, fancy the thought, wearing a gun! amazing! News like that had to be told far and wide, and as fast as possible. Martha scurried into the house, she knew she had to get the kids situated. Only one bedroom other than the master bedroom, but it had two twin beds in it. She explained to the kids that it was only a temporary thing, they would have to be in the same bedroom. Jade rolled his eyes, he had enough of Madison, just with her being his sister. Madison sighed, she knew jade was such a messy boy, he would have the room in chaos and disorder. Well, it was only for a day or two. Jade went in and dumped his suitcase on the floor one side of a bed. And Madison went in, and set up er side of the room neatly. She folded the clothes, and put them in drawers. And stacked a last few items on top of the dresser. That looked much better n ow, looked distinctly lived in. Lived in, well, that's a description of Sean's room. Back at Gomer's compound, each of the three kids had different house keeping style. Sean was was a walking tornado, he could scatter things every where he went. Left a confusion of clutter behind him. Melissa was orderly, to the maximum. She had to have things lined up neatly. Zack was mostly orderly, but a few things out of the way. Heather's house keeping was rapidly falling off, into disarray. She had spent so many hours taking care of Faith. On the half hour, Heather did a vital signs check on Faith. She was starting to come around. Her pulse was stronger, and she was just starting to respond to the people around her. Naturally, her girls were thrilled. Savannah and Bobbi took a long time telling their Mom about how she had crashed into a deer, and had gone off the road. They spent the night huddled together to stay warm, and had built a camp fire in the morning. Faith was stll unconscious, but it did the girls good to have someone to talk to. The girls needed to talk. And Heather had a need to talk to someone. She was worried, the boys should have been back from Ohio, by now. Heather called Gomer, on the cell. Gomer had been sitting in the recliner chair in Sam's living room. He had hardly moved, just sipping his glass of iced tea. Couldn't really call it "iced tea" without the ice. Playing his hand held video game. he'd stop between screens, and stare off into space for a long time. Gomer did answer the telephone, and Heather could tell instantly hat there was something wrong. She asked what was wrong, but Gomer only mumbled that everything was OK. But, she knew it wasn't everything OK.
Heather disconnected with Gomer, and called Chris on his cell phone. Asked what was wrong with Gomer. Well, best anyone could figure, he was having a rough time being without his Ford. But, we really weren't sure, either. Maybe a Sunday in church would help. Heather actually laughed out loud. Church! Ha! Gomer wouldn't be caught dead in a church. Just not interested. However, that's a really good idea. Heather would take the crew in the Buick, to church tomorrow. That's what they all needed so much. Get out of the house for a while. Got to wash some clothes, and see if she could get Sean to church without him looking like a wild Indian. Preheat the oven to 375 degrees. Combine the first five ingredients in a medium bowl. If using dry milk and dry eggs, add those powders to the dry ingredients. Combine the milk (or water), applesauce, butter, and egg (or water) in a separate bowl. Add wet mixture to dry ingredients; stir well. Pour into a greased 8″ square baking dish. Bake for 20-25 minutes or until just set. Makes 4-5 servings. Oh No! 2012 Is Right Around The Corner! If you hit this blog looking for end of the world info due to the Mayan calendar ending in 2012, you might want to check out this link. If you landed here looking for info on how to survive and maybe even thrive when TSHTF stick around for awhile. Today I’d like to chat about doomsday cults and other organizations that whole-heartedly put all their doomsday eggs in one basket. I was reading this story on CNN the other day about a group of people who think that the world is going to end on May 21, 2011 due to some guy’s translation of events in the bible. Interestingly, a lot of end of the world beliefs are religious based, but not all. In the last couple thousand years there have been hundreds of people predicting the end of the world which, as you can see, didn’t quite pan out. Then I got to thinking: What’s the difference between me and all these people who are followers of these religious leaders (or anyone) predicting the end of the world on a certain date? What would cause me to walk away from family, friends, my home, pets, and all my stuff? Well, a loaded gun might convince me to move on, but rest assured I’d be back with a plan and a bigger gun. The fundamental question really becomes: what is the difference between these people and myself? Is it a fine line or are they big differences? First of all, most of these people take the bible as a literal translation. I don’t. I’m neither anti-religious nor over-religious. I tend to be scientific in my approach to things and in those matters the bible doesn’t enter into my thinking. So if someone were to tell me that on May 21, 2011 the world is going to end I’d say, “Oh yeah? Can I have your car if you don’t want it anymore?” Sorry, but I just don’t believe that the world is going to end due to a religious Armageddon. Ever. Another difference is that these people tend to believe in a specific date that the “event” is going to transpire. From where I sit there’s no way you can predict something from the bible by going in and trying to unlock secrets that are ambiguous at best. And don’t think I’m referring only to the bible because I’m not. This also applies to any book, religious or otherwise, that has predicted the end and failed including the above mentioned Mayan calendar. While we may predict some events that may happen such as the real-estate bubble and crash, a market crash, or political events such as the revolt in the Middle-East, it’s nearly impossible to specify the year it will happen much less a certain day that it will unfold on. Instead someone (Peter Schiff for example) says, “Watch that housing bubble. It’s gonna pop some day,” and when it does he suddenly looks like a genius and gets vaulted into the limelight. Third, these people believe that “The End” is total. All life will be wiped out. I do not. Sure, there are certain scenarios where it could happen, but it’s not likely. d.) I wouldn’t walk away from everything even if I did believe the “end is near”. So Why Do I Prep? If I don’t believe all these warnings of doom why do I prep? Excellent question. While I may not believe in portents of doom that come from many directions, I do believe that trouble could come from just about anywhere. If you look around the country and the world today you can see many reasons to be prepared for trouble: trouble in the Mid-East pushing up oil prices, an aging infrastructure for electrical delivery, water delivery, and a JIT system dependent on fossil fuels (see the Mid-East reference above). Add to that an economy being flooded with money (currency debasement) and food crops in trouble due to crazy weather patterns, then I’d say there’s plenty of reason to have a pantry full of food and some kind of SHTF plan. SHTF could mean anything from a fire or flood in your home, to an economic meltdown, to a nuclear war. Some of these events are more likely to happen than others; however, that doesn’t mean I’m not going to take a little time and prepare myself for anything that might happen. By having a nice full pantry, gasoline standing by with a generator, a water filter and water barrels among other things, I know that I can get by for a time without outside help if need be. I don’t have to rely on anyone else to bring food or water to me or my family if TSHTF. How many people have you seen standing in food lines or staying in shelters after a disaster because they didn’t have anything at home? To say, “Well, that ain’t never happened before and it won’t happen now,” is one of the most asinine arguments a person can make. Anything can happen and given enough time most likely will happen. The question is will you be ready when it does? There have been comments on this blog (and other blogs) lately about preparing out of fear. I don’t prep because I’m scared and I hope you don’t either. I do it so I don’t have to be scared. If you don’t believe that something bad will ever happen go ahead and cancel your insurance. You won’t get in an accident, or get sick or break a bone or have some kind of medical emergency. I don’t pay my insurance premiums because I’m scared, I do it because when TSHTF I’ve got some back up. Unlike an insurance company though, my preps won’t fight me when I make a claim! My personal belief is that when you do prep and are fully prepared (whatever that is), or even somewhat prepared, then fear doesn’t play into it. Prepping is your insurance policy and should give you peace of mind when things get ugly. Getting back to 2012… I believe there is no chance that the world will end because a calendar written 2011 years ago suddenly runs out. But I’m ready for it just in case. I’m sure there were people sitting around just before Vesuvius blew its top back in the summer of ’79 AD saying just that. Read here for an interesting history of that volcano. I didn’t realize it’s erupted 50 times since then though. History does repeat itself folks! "And you should have seen how dirty Sean's clothes were!" Melissa was telling Heather. Dinner had ended, and Heather helped carry the dishes back to the kitchen, so they could be scraped, and put in the dish washer. Melissa was giving a good report, about all the things that happened while Heather was out on the medical rescue mission. Aparently, Sean lieks to play in the dirt, which is common for boys of that age. There wasn't much to scrape off the plates. Years of practice, the kids knew to take small portions, and come back for seconds. There was plenty of food, but no waste. And, at Sam's, there was little waste, either. Except perhaps Gomer's plate, Gomer had been eating a lot less food, now that his physical activity level had fallen way off. Spending all his time in the recliner chair, listening to the radio. Chris had been hauling fire wood, and had been doing other home repairs at Sam's house. Sam had been hobbling around. It was only a couple days since he broke his leg, but he was trying ot get back into action. As they were finishing dinner. Sammy went out the back door, carrying a couple of granola bars in his hand. Sam didn't know what that was about. But, there was plenty of supplies, so he didn't say anything about it. At Bill's retreat, Martha had listened to the Madison and jade for about half an hour. As they talked, the three of them went to the dining room, and Martha sat down, and shared the last of the chicken with them. And a glass of Kool Aid to wash it down. She listened, and listened. Finally, Martha suggested that the kids come to live with them for a couple days, while we see about getting the house cleaned up. And find some adults to help take care. Both kids were thrilled with that idea. Martha made the best home made cookies. And they were scared the bad men would come back. Martha sent the kids to their bedroom, to pack some clothes for the over night. And now, to find the house keys so they could lock up the doors. Martha looked in all the usual places for house keys. Kitchen counter, and hook by the door. Finally Jade came out with a huge suitcase, dragging the heavy weight behind him. Martha asked about the house keys, Jade knew just where they were, in the drawer in the buffet, in the dining room. Why the heavy bag? Well, Jade wanted to be sure he had enough clothes. Martha asked for a look. It seemed that he had packed every stitch of clothing he owned. Madison came from the bedroom with one light bag. She had packed two changes of clothes, one pair of shoes, and a light weight jacket. They loaded the laundry in the back of Martha's car, and then the kids started to argue abut who got to sit in the front set. Martha, being a diplomat, suggested they both sit in the front. The seat was wide enough to fit both kids. And the safety belt fit nicely over the top of them. Not many people out with cars, but still, it's good to be safe. The roads were uneventful. No cars. Martha turned into her own driveway. As they drove down the long, winding driveway, they noticed the smell of smoke in the air. They got around the last turn in the driveway, and found Martha's husband, Peter, using the garden hose to wet down a pile of charred wood. That's strange, she thought. we weren't scheduled to have a bonfire today. And Peter had a revolver on his hip. Even more strange, Peter doesn't like guns. And then, as she thogught about it, that's just about where the old shed was, the one they weren't using. She drove up, and rolled the window down. Asked Peter what was going on. He didn't speak, as was his custom. But, he did point once to the pile of embers. And then he pointed to the house, and then pointed off into the back of the house. Peter went back to wetting down the smoking pile of wood. Martha and the kids went to the back of the house, and found the back of the house had a lot of black char on it. Aparently, someone had tried to burn down the house. Farther back from the house, was a car they didn't recognize. Laying next to the car, there were two men in black robes, and turbans. This didn't look good. The kids started quietly crying. Theh had enough death in their lives for the last couple days. they didn't want to think that maybe those two men were dead. Martha took the kids by the hand, and led them around the front of the house. She walked up to Peter, and asked what happened. "Couple of them. Fire. had to bring their car around." Was about all she could get out of Peter. Well, guess they had to let their imagination fill in the details. Still, it didn't loook good. At least the house was still standing. Peter wasn't the only guy who was talking a lot less than usual. Sam motioned to Chris, and wanted to talk for a moment. Sam got his crutches, and they went out to the back yard. There were a couple outdoor chairs, and Sam lowered himself into one, though not all that gracefullly. Chris sat down in the other one, had to twist around a bit, to get his holstered revolver to fit in to the chair. Sam asked what's with Gomer. He's not the cheeful kind of guy that you were teling me. Chris wasn't sure, but resolved dthat he'd have to ask some time, and see if he could find out. Might have had something to do with burning up the truck, that's about the time Gomer started to seem "off". Well, maybe time for some emergency psychiatric first aid. In the house. First aid was about all that Heather could do for Faith. But, that's OK. Since Faith was starting to get better on her own. it had been about 36 hours since the wreck, and she was starting to come out of it, a little bit. At least she was responding, a little bit. Who knows, maybe another day or two, and she'd be fine. Sammy came back from his afternoon walk, looking healthy, and cheerful. Sam wondered what was with that, but didn't say much. Brenda had also been out, checking with the neighbors. She came back, but looking a bit worried. Sam asked what was going on, in the neighborhood. Brenda was more than happy to talk about it. What primitive and modern fish trapping methods have you used with success. I learned the other day that you can actually trap fish with modern conibear traps which is something I keep in my bug out bag. You just have to funnel them correctly. What odd tricks do you know for putting fish on the table? This is a video of how to employ a primitive basket fish trap which I made the awhile back. Trash can be very useful in a survival situation and can be found almost every where you go. What are some methods you have devised for using trash in survival. This video is how to catch minnows for food or bait in a survival situation! "Backfeeding" with a honda generator? Prices Are Going Up! Make a Plan Now! A Big Welcome to our Newest Sponsor! Emergency backup battery for recessed lighting? The Wire Coat Hanger: What's your use for it? HOW TO: Great beef jerky.